Travel Tales From Spiti: The Legend of The Moving Monasteries. Spiti is a land of legends. Every mountain peak and rock formation has a story lurking behind it, handed down by generations of Spitians. The most fascinating of them is one I heard from a local friend, of a mountain peak which changes colors a few times a day, reflecting the mood of the deity that inhabits it. It takes 3 days to walk to the base of this peak from his village in Linkti, camping at nightfall along the Spiti River… But I digress. The mystery mountain is a story for another day. I’m currently at 4587 metres at Komic, and literally high at what is said to be the highest inhabited village in the Himalayas. As I count the 13 houses in this small village, I try to imagine how people lead such isolated lives. Perhaps a consolation is the Buddhist Monastery at Komic, where lamas (monks) pray and meditate at one of the highest altitudes in the world. Legend has it that due to a drought, the monks of Komic decided to shift the Komic monastery to the nearby, relatively lower-lying village of Hikkim. The Mahakal statue, believed to symbolize the Protector of Dharma, however, refused to move from its foundation in the ground of Komic, despite numerous chipping and lifting efforts by the monks. When the entire monastery moved to Hikkim, the statue remained adamant at Komic, together with one monk who would continue to pray before it. 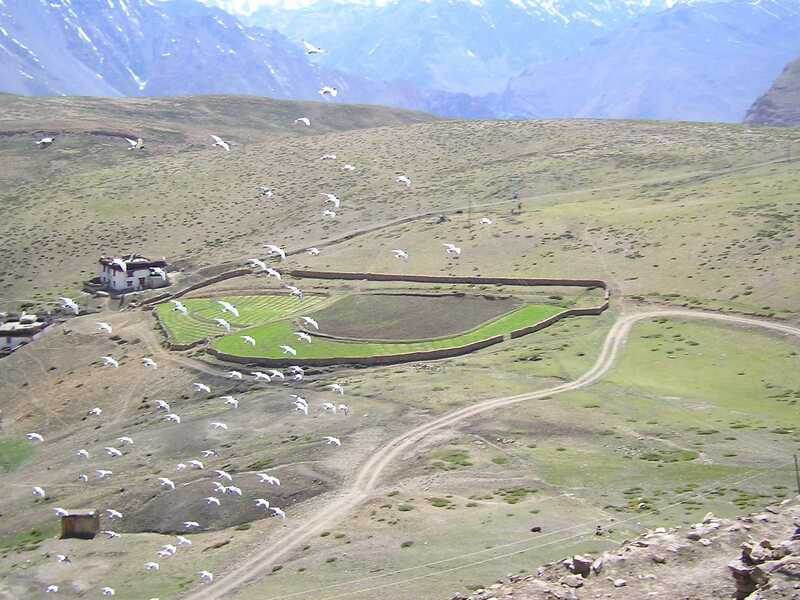 In 1975 or earlier, an earthquake rocked the high altitude villages of Spiti, reducing the Hikkim monastery to ruins, still visible atop a small hill. Surprising the monks, the Mahakala statue in Komic held its ground even amid the devastating tremors. Convinced that Komic was the holiest place for a monastery, the monks decided to move back to Komic, where the monastery stands to this day. Thanks to this patriarchal society, all I could see of the Mahakala legend was a little board saying, “women not allowed”. Well, at least faith can move monasteries if not prejudices! This article was published on Yahoo (Associated Content). Travel tales from Spiti: Once a nun. Travel tales from Spiti: Entrepreneur at 12. Travel tales from Spiti: Kaza’s garden lady. I am waiting for a more personalized experience sharing. Beautiful story..If one stayed in one of the 13 houses one might think that a 14th house was an intrusion. I wonder how they would react to flats and houses piled on top of each other! True! Their houses are almost like mansions, with an upper floor for the summer and lower floor for the winter. But the world of consumerism is such that they might just take a fancy to flats! Thanks 🙂 and welcome to The Shooting Star! Great story. By the way, where is Spiti? Although I have seen many a temporary settlements at great elevations in the base of mighty Himalayas, the highest known village to me is located at some 4,000 m ASL. 4,587 is a phenomenal elevation with conditions extremely harsh for most of the year. There is something very unique, historic and romantic about those monks and monasteries and the pics are amazing as usual. One of these days I stumbled upon another very interesting piece of info that the highest gas station in the world is located in Hamachel pardesh at an elevation of 4,205 m.
It’s an amazing place indeed 🙂 And the highest gas station is indeed located in HP, in the town of Kaza in the Spiti valley. Although the conditions are really harsh at such high altitudes, the locals make a conscious choice to live there. That is a really interesting story how they moved the monastery back. While your photos do show off isolation, I can see why some would want to live in such a remarkable landscape. Thanks Suzy 🙂 Trans-Himalayan legends have a way to get you so intrigued. Wonderful! I am planning to do the Spiti left bank trail later this year.. Komic is one of the villages on this trail.. Awesome, you’ll love it 🙂 Make sure you stop by Langhza on the way. It was my personal favorite, with bare, green & white mountains. Thanks Sebastian & welcome to The Shooting Star 🙂 I’m in the midst of launching a little initiative to introduce travel enthusiasts like yourself to a “different” side of India. Here’s an invite – https://www.facebook.com/IndiaUntravelled . Look forward to connecting with you! That’s great. 🙂 Thank you. I’m a travel photographer and sometimes writer so such kind of information is invaluable to me…will be very useful for my next visit to and journey through India. I look forward to reading more about parts of your fascinating home country that I don’t know about. Sounds great. Saw your photographs on your blog, they’re lovely 🙂 Let me know when you’re in India again. Would love to catch up over coffee. Thanks. If your Balkan journey takes you further into Austria (just a stone’s throw or two away ;)) let me know. The Alpine countryside here is worth to be seen and walked through as well. I’ll be home until late summer, then hope to be in India again. Hey wonderful blog, your stories from Spiti brought back memories of my solo trip last June. Everything is still so fresh in memory, those deep valley, gorges and the feeling of standing among those prayer flags atop Komic on a cold windy day. Nothing tops that feeling 🙂 Looking forward to hearing more stories from you, keep blogging. Oops, I was probably choosing between specifying the height in feet or metres and went with parts of both :p Will change it right away. Thanks! And welcome to The Shooting Star, Ameeth. Reading your comment has transported me back again to Komic too. Hope to go back there another time. I just cant help but add on another fact about this village. A temporary polling booth is also setup for these 13 houses! Your travelogue brought back memories of komic and lanza . I was upset not being allowed indide the monastery, to see the stuffed snow leopard at the entrance. I stomped out and as I was loitering there,I came across amonite fossils . That made my day. Previous PostTravel Tales From Spiti: Entrepreneur at 12. Next PostTravel Tales From Spiti: Kaza’s Garden Lady.